This a.m. my dear husband and I woke to the sound of shouting. Loud shouting. Loud, profane shouting coming from outside. 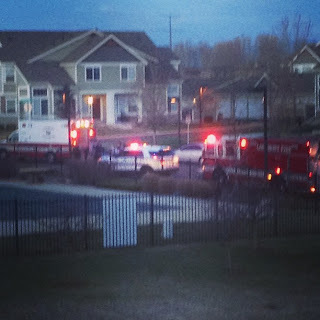 We were woken up once more by the sound of sirens. Looked out the window and what did we see? Coppers. Six squad cars worth. Then a firetruck. Then, finally and ambulance (seems like that should have arrived first?). A paramedic lifted an occupied stretcher, but I was too far away to see a face or determine if the face was still breathing. Within five minutes the entire law enforcement team dispersed and now all that's left is a ghastly spot of blood on the street.